Filters are what you'll use in reports to slice your data and ensure that you see the right subset of results. Open up the Report Editor for your report. Below the top bar of buttons within both the report and dashboard editor, you'll see an empty area with a "Create Filter" button on the far left side. You can create filters by clicking on that Create Filter button and choosing the field you want to filter by. Depending on the type of field you select, you'll get a different set of contextual filter options. Single Value gives you a simple dropdown containing the different values found for the grouping. This option is best for a small number of values. 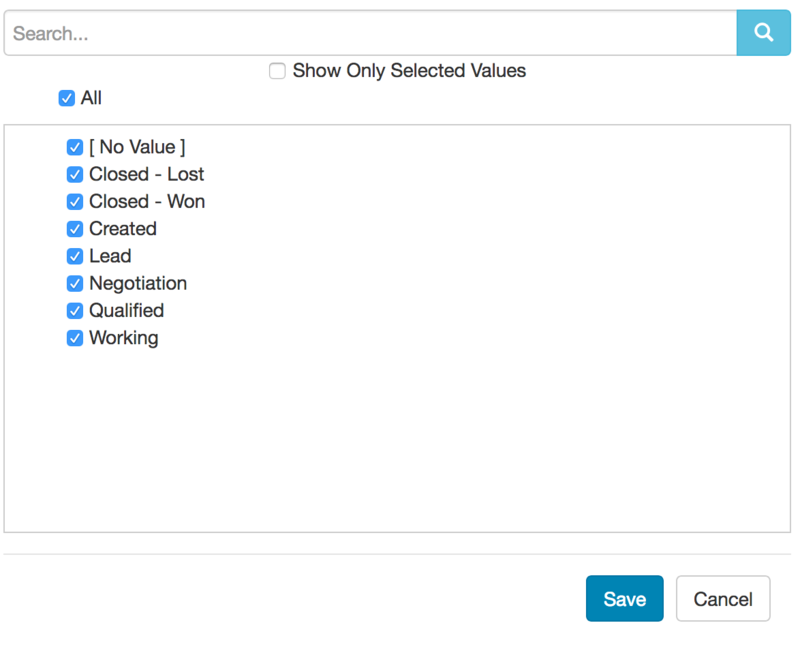 Multi Value gives you a searchable pick list of values. This option works better with a large number of values. You can also connect multi value filters so that the selection in one will limit what's shown in the pick list of another and you can limit the maximum number of selections. Pattern Match gives you a text input for finding any value containing the selected text. You can control whether or not the text has to be an exact match, whether or not the search is case sensitive, and whether or not the search is a regular expression. Rolling gives you a simple dropdown containing a variety of rolling time windows such as Last 30 Days, Last Full Quarter, and This Year, as well as allowing you to define custom rolling options such as "Last 2 Full Weeks" or "Next 3 Months". Absolute gives you explicit selections for start day/month/year and end day/month/year. 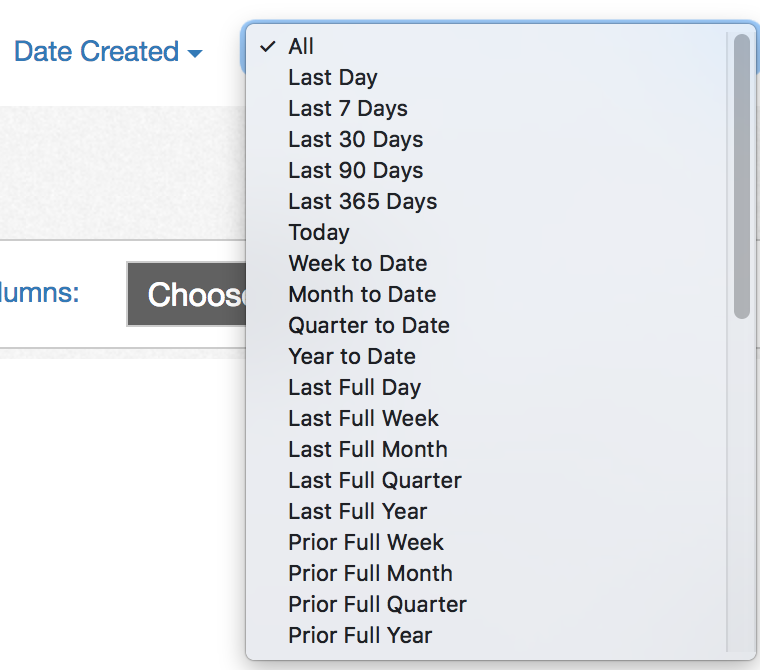 You can configure the filter to only have a start date or to only have an end date as well. If you choose a Measure, you'll get a single type of filter which allows you to restrict to anything within a certain numeric range. Once you've created a filter, you can delete it by clicking on the filter name and choosing "Remove the Filter" from the dropdown. By default, any filter you create is applied to the whole report. There will be cases where you only want to apply the filter to a particular field within the report--for example, in a sales report, you may want to see all sales reps, the number of deals they won, and the number of deals they lost. The solution is to apply a field level filter. Click on the field name in the report, choose Edit Field Properties from the drop down, and click over to the Filters tab. Create your filter within this window, as opposed to the report editor's main filter area, and the filter will only be applied to this particular field and not across the whole report. Or Filter - a filter containing multiple additional filters, wherein the filter is considered to be true if any of the filters it contains evaluate to true. Field Choice Filter - a filter which allows the end viewer to change a particular field of the report. For example, you might have an Interactive Chart where the end user can pick from a sub list of fields to choose the grouping and measure displayed in the report. Multiple Field Choice Filter - a filter which allows the end viewer to choose one or many fields from a sub list of fields to be displayed on the report. If you click on the filter name within the report editor, you can choose Edit Filter to navigate into the filter editor.